And Jesus, full of the Holy Spirit, returned from the Jordan, and was led by the Spirit  for forty days in the wilderness, tempted by the devil. And he ate nothing in those days; and when they were ended, he was hungry. The devil said to him, “If you are the Son of God, command this stone to become bread.”  And Jesus answered him, “It is written, `Man shall not live by bread alone. '”  And the devil took him up, and showed him all the kingdoms of the world in a moment of time,  and said to him, “To you I will give all this authority and their glory; for it has been delivered to me, and I give it to whom I will. If you, then, will worship me, it shall all be yours.”  And Jesus answered him, “It is written, `You shall worship the Lord your God, and him only shall you serve. '”  And he took him to Jerusalem, and set him on the pinnacle of the temple, and said to him, “If you are the Son of God, throw yourself down from here;  for it is written, `He will give his angels charge of you, to guard you,’  and `On their hands they will bear you up, lest you strike your foot against a stone. '”  And Jesus answered him, “It is said, `You shall not tempt the Lord your God. '”  And when the devil had ended every temptation, he departed from him until an opportune time. As noted in yesterdays’ post, The Temptation is in some ways a reprise of the temptation that occurred in Eden (Gen 3:1-19). 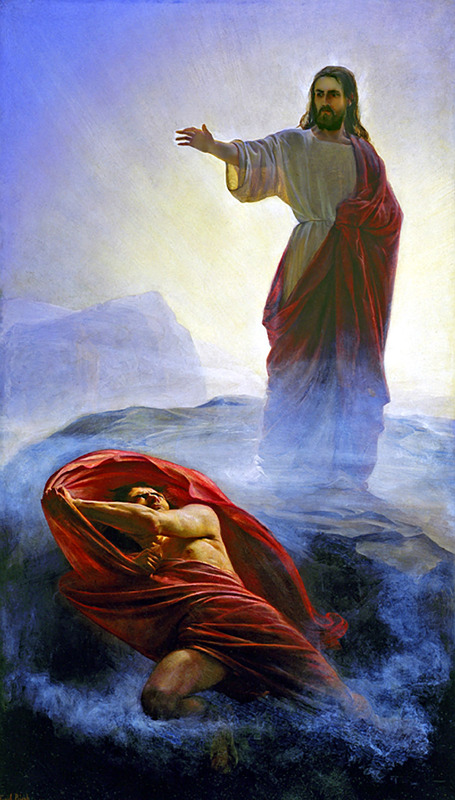 The first Adam, a man, fails completely when tempted by Satan. Jesus, the New Adam, will have no trouble with Satan. Satan has evidently been watching Jesus in the desert, for Satan knows Jesus is hungry, so he seeks to tempt Jesus with the most obvious temptation: food. What Satan doesn’t know, is that Jesus is the Son of God, and as such, can never be defeated by Satan, for Jesus is Divine and could never fall into the sin of being tempted (Jas 1;13; 1 John 3:5). Satan, uncertain, starts with “If you are the Son of God…” Poor Satan; he doesn’t have a clue of who he is dealing with. Jesus, on the other hand, knows exactly who He is dealing with. And, perhaps just for fun, allows Satan to try his tricks. Satan attempts to tempt Jesus in 3 different ways: hunger, power and the questioning of God. As if to flick away a troublesome fly (interestingly, in the Old Testament (2 Kings 1:2-3), the devil is referred to Beelzebub, “the lord of the flies”), Jesus efficiently quotes Old Testament scripture to refute Satan’s temptations. Jesus never acknowledges to Satan that He is, in fact God. He does not tell Satan nor does He perform any miracle that might give evidence to Satan about the Son of God. Jesus God-handled Satan at the Temptation, and Jesus still does so today. All we have to do is ask for Christ to help us when tempted by Satan, and He will.